This stunning diamond cluster engagement ring has been crafted from 18 carat white gold. The large dress ring design features three vertically set baguette cut diamonds to the centre surrounded by four claw set brilliant cut diamonds to each corner. The central design is further accented with a slightly smaller baguette cut diamonds adjacently set to either side. The central design is surrounded by a cut cornered rectangular design of brilliant cut diamonds. The flared ring shoulders are further accented with claw set brilliant cut diamonds graduating in size. This ring looks fabulous when worn and will make a perfect engagement ring the different cut diamonds offset one another fantastically, this ring is truly showstopping. The ring is available in a variety of sizes, please state ring size when ordering. 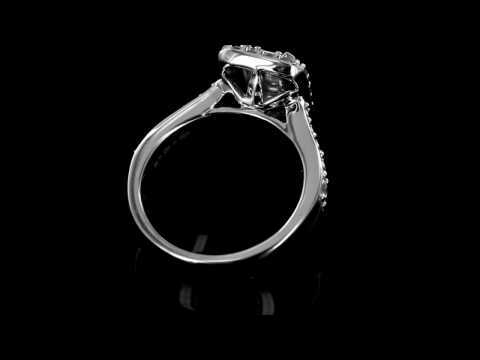 If you have any question regarding this diamond cluster engagement ring please do not hesitate to get in contact with us. Set with impressive baguette and brilliant cut diamonds. Total diamond carat weight 1.00 carat. This ring is available in a variety of ring sizes.